Stock market is expected to open lower tomorrow. 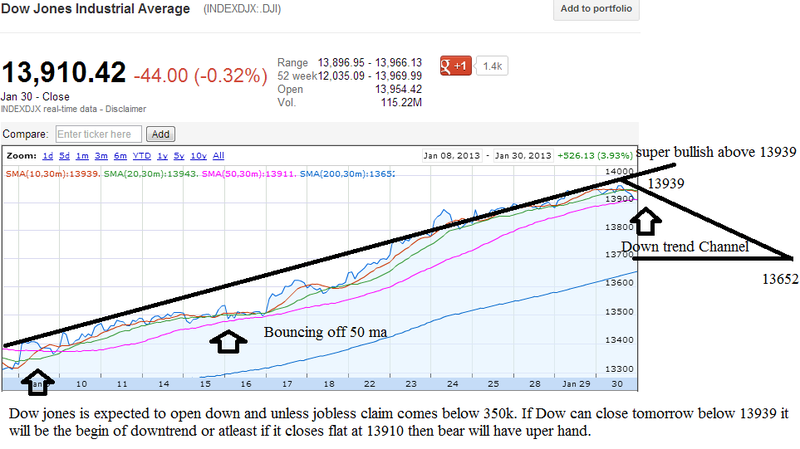 But Dow Jones and S&P500 is still showing lot of strength inspite of weakness in broader market. It is still very tough market to trade as most of the action take place in premarket and after hour, during market hour stocks are kept flat for the most of the time. It requires lot of patience to trade this market. Even following the trend is very difficult, and neither economy data or earning report matters. After amazon earning I believe even HFT doesn't follow headline because the headline was negative but stock rallied. Its very dangerous market and chances of losing money is 90% then making money. Becareful playing this market, use tight stop and play in 1st hour and last hour. Rest of the time it will be all algos play. Goodluck Watchout FTNT, FIO,LVS, DNKN,KERX, JDS,ALGN,WHR. 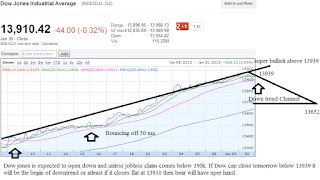 Dow jones is expected to open lower tomorrow but the true test will be whether it can close below 13911.